Our Corn Maze is unique for several reasons. First, it’s kid-friendly. The Corn Maze covers six acres and you can wander around it for 30 minutes to an hour. Families enjoy it because it’s simple and it also includes a scavenger hunt where you can find all 9 AG HEROES, answer a related question, and get a hole punch! Finally, we donate 100% of the proceeds from the Corn Maze to charities that matter to our family. We like to call it “Corn Maze for a Cause”. When you pay for your Corn Maze admission, you get to choose which cause you want to support. We hope you’ll find joy in giving! Catoctin FFA – Select this cause and your corn maze admission will support agriculture education and leadership development for Catoctin FFA students at Catoctin High School (CHS). Future Farmers of America (FFA) makes a positive difference in the lives of students by developing their potential for premier leadership, personal growth, and career success through agricultural education. We are very grateful to the students in the CHS FFA this year. They brainstormed a new way for us to educate our customers about agriculture commodities in the maze! When in the maze, you will have to find all 9 AG HEROES, answer a related question, and get a hole punch! We love the ideas they brought to the table for our 2018 year and wish them the best of luck presenting their ideas at the National FFA Convention later in October! Cleveland Clinic’s Endocrinology and Metabolism Institute – In 2016, three members of our immediate family were diagnosed with a rare genetic condition called Multiple Endocrine Neoplasia (MEN) 2A that causes thyroid cancer, parathyroid disease, and adrenal gland tumors. Since it is such a rare condition, we were blessed to find Dr. Eren Berber (Cleveland Clinic) who could provide ongoing treatment and care for Sam, Julie, and Bailey. As an endocrine surgeon at the #2 hospital in the United States, Dr. Berber uses amazing technologies in robotic endocrine surgery. We are grateful to live in a country where healthcare is accessible and where medical technology is always developing and improving. Select this cause and your corn maze admission will benefit Dr. Berber and his department at the Cleveland Clinic. Good News for Appalachia: Home Repairs & Outreach to Children – Each summer teens and adults from Good News Presbyterian Church of Frederick serve widows and others in need in the heart of West Virginia’s coal country by repairing homes, building handicap ramps, and introducing children to Jesus Christ through a vacation Bible school. Good News Presbyterian Church is a congregation of the Associate Reformed Presbyterian Church, a Bible-based denomination founded in 1782. Their worship services are characterized by simple dignity, a focus on the majesty and greatness of God, and the careful exposition of God’s Word, the Bible. They meet for worship on Sundays, 10:30 a.m. at Tuscarora Elementary School, 6321 Lambert Drive, Frederick, MD 21703. They also offer Bible classes for all ages at 9:30 a.m. Select this cause and your corn maze admission goes directly to meeting the physical and spiritual needs of widows and children in Appalachia. For more information visit goodnewspres.org or call 301-473-7070. Judy Ramsburg Memorial Scholarship – Our family has set up a scholarship through the Community Foundation of Frederick County in memory of our beloved daughter, sister, and aunt–Judy Ramsburg. Judy brought joy to everyone she knew. She loved to laugh and spend time with her friends and family. It is our hope that this scholarship will bless others as Judy blessed our family. The fund will provide scholarships to residents of Frederick County who attend Frederick Community College. 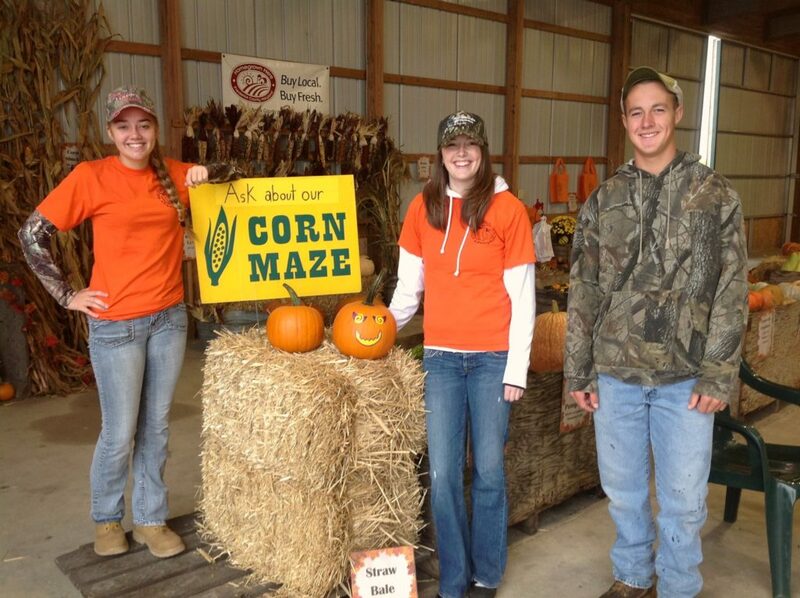 Select this cause and your corn maze admission goes directly to the scholarship fund. Tuberous Sclerosis Alliance – TS Alliance is dedicated to finding a cure for Tuberous Sclerosis Complex (TSC) and improving the lives of those affected by it. TSC is a rare genetic disorder that causes tumors to form in various organs, primarily the brain, eyes, heart, kidneys, skin, and lungs. It’s the leading genetic cause of epilepsy and autism. TS Alliance is a new cause that we learned about through one of our Brookfield Pumpkins’ customers whose daughter, Brynleigh, has TSC. Select this cause and your corn maze admission goes directly towards research, treatments, and finding a cure for TSC! For more information, visit tsalliance.org.